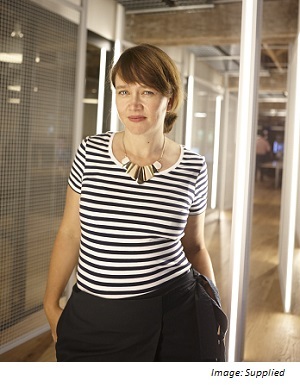 Heather Catchpole co-founded STEM (Science, Technology, Engineering and Mathematics) specialist media company, Refraction Media, in 2013 with a view to create a smarter future – one in which everyone has access to the skills they need to make a better planet. She previously worked as an editor, science news journalist and producer at the ABC, Cosmos magazine and CSIRO. Refraction Media have distributed over 1 million magazines to students across the USA, Australia and New Zealand through the Careers with STEM brand. In 2015 the company was awarded as Publish Australia’s best small publisher and was twice shortlisted best startup in the Telstra Business Awards. Her Twitter handle is @hcatchpole. What was the initial point of inspiration for starting Refraction Media? My business partner Karen Taylor-Brown and I met at Cosmos magazine where I was managing editor and she was the associate publisher. The business changed hands and we were made redundant, but we saw an opportunity to found a custom publishing company which continued to specialise in the high-quality journalism Cosmos was known for. We also knew that science and technology had an image problem that needed a content solution – fewer mainstream news services were reporting on science, and science journalists were losing their jobs. This opened an opportunity for us to develop creative solutions to tell science stories in a way that connected with audiences. Are there many challenges for women working in STEM fields? There are many challenges for women in STEM with ‘leaks’ all through the pipeline – from getting more girls into STEM studies, to women dropping out of STEM careers and being slower to receive tenured positions, grants and industry funding. Female enrolments in ICT have crept up from a baseline of 10,000 or below, which stagnated over the last decade, to 12,000 in 2015 (the latest DET stats available). Over the same period, engineering enrolments shifted to 18,000 women nationally. It’s still a ratio of just 1 in 6 women to men for ICT and 1 in 9 for engineering – stats that make for uncomfortable reading when you’re imagining being the ‘only girl in the class’. In the Careers with STEM platform we represent gender equity as we want to see it – as 50/50 across STEM fields – and it’s not hard to find women working in leadership areas that are willing to share their story. The challenge is changing the system to create tools for greater equity, from a more holistic approach to academic evaluation criteria, to creating networking opportunities beyond the ‘old boy’s club’ in the industry – particularly when hiring for boards. How can we encourage more women to pursue careers in STEM and other historically male-dominant jobs? We need to emphasise that science, tech, engineering and maths are critical tools for our society and set about smashing the stereotypes set up by pop culture like The Big Bang Theory. Girls of the centennial generation are deeply interested in social change and in making a difference. STEM gives women the skills, tools and mindset to solve many of the critical challenges of the 21st century – in creating equity, adapting to water shortages and climate change, in developing and working with technology across all areas and in every career. Plus with many universities and companies developing diversity policies, there are great opportunities to carve a fast-moving, interesting career for yourself. What does a press release have to contain to be relevant to you? We focus on pathways into careers in science, technology, engineering and maths (CareerswithSTEM.com), industry-research partnerships and Australian STEM start-up stories (ScienceMeetsBusiness.com). So, I’m looking for stories specifically in these areas. A good press release will quickly indicate what is new or different, include the relevant interview contact (rather than the media comms contact), and include images. We’re looking for stories where we can quickly identify opportunities and see how we can make the story unique to our platforms and connect with our audiences. If there has been one BIG lesson in getting to the stage you’re at now, what would that be? Maintain your integrity, and do what you believe in. As a journalist you are always in the public eye – your work is immediately evaluated by your readers. And they pay close attention to detail. Also, never underestimate your audience, and keep it real!